It’s time to keep track! 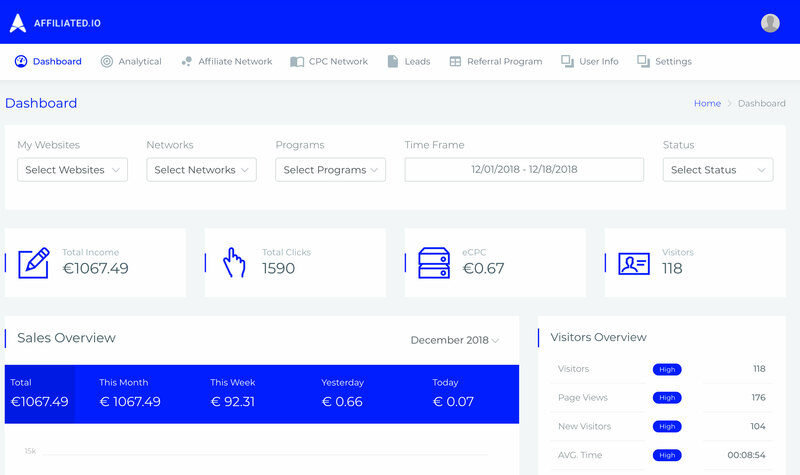 With Affiliated.io you can connect your Google Analytics with a lot of affiliate networks. Thanks to our dashboard you can easily see the statusses of your leads and also apply filters for a clear image of how well your sites are preforming. No need to login at different networks and applications. The financial speadsheets are no longer necessary. Our cross-device app will make sure you know everything on the go and almost in realtime (every 15 minutes). Choose to receive the report and notifications that you want. This can be per lead, day, week, month and even year. Networks don’t always give updates on when leads turn into sales. Get instant notifications when (dis)approved. We are working hard to make you (very) happy. We are adding networks, analytics and features continuously. Affiliated.io is for any affiliate marketeer, big or small. Our mission is to bring you an overview that you can filter and monitor anything you want: from website income to specific leads. We’re combining affiliate networks into one, simple and easy to use dashboard. Go to the register page and fill in your credentials. We currently have 2 accounts, free and premium. If you only have 2 networks + Google Analytics, choose the free account. Do you want to connect more? Choose a premium account (€9.99). Go to the network page and connect your networks. Make sure you follow the correct steps. This will only take 5 minutes. Last but not least, we want you to enjoy our dashboard. We’ve worked hard at it. The networks on the right can all be imported without any hassle. As soon as the appropriate info has been provided, Affiliated.io will fetch your data! If you see a 🤷‍♂, this means we’re implementing it. Do you have a network you would like to see? Let us know! Affiliate marketing is one of the legitimate ways to make money online by referring customers to … Read More about How Does Affiliate Marketing Work?